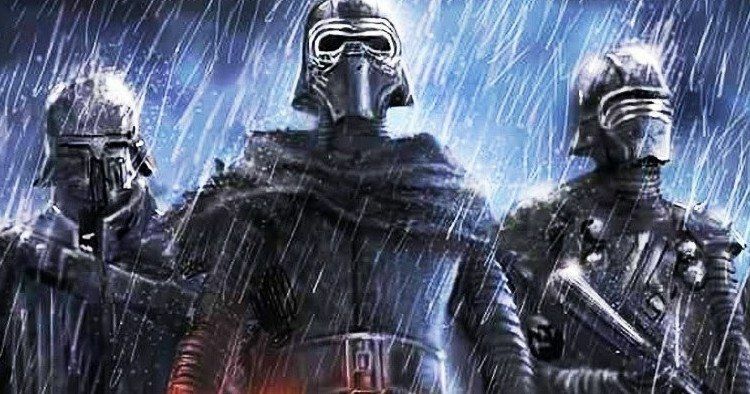 Is Star Wars 9 Titled The Knights of Ren? Star Wars 9 is less than a year away, and it still doesn’t have a title. Fans are eager to discover this clue about what is being called the final chapter in the Skywalker saga. But they may not get an answer until Star Wars Celebration kicks off this spring. A new report has delved deep into the so-far provided clues, and a favorite possible title is The Knights of Ren? So how did that conclusion get reached? So far, when it comes to The Force Awakens and quite literally in the case of The Last Jedi, clues to Star Wars titles are always hidden in the opening crawl, of which Rogue One and Solo totally ditched. Digging through what we’ve already seen on the big screen, The Knights of Ren is a frontrunner, and makes a lot of sense. It teases that we’ll finally get to see Kylo’s Knights of Ren in action as they’d play an important role in the storyline, after having been left out of the previous sequel. And it’s a play on words that suggests this is Ren’s big night, his time to shine. He is one of the last remaining from the Skywalker bloodline, after all. The new Star Wars titles have so far been the first clues as to what the upcoming movies would be about. The Force Awakens title was delivered well in advance of the first teaser, as was The Last Jedi. But Disney may be taking a new approach. The studio didn’t release the Avengers: Endgame title until the first trailer hit, giving it all an extra push of publicity. The Disney marketing team may be looking at how well that did, and are reserving the title reveal for Star Wars 9 in the same manner. Everything about Star Wars 9 remains a mystery at the moment. There are a few sparse details, but nothing substantial in the way of plot. In the early days, George Lucas opted for pulp type titles for his first two trilogies. We can expect Star Wars 9 to have a title that falls in line. Some are hoping that the title is simply Star Wars Episode IX: The End. But that doesn’t really fall in line with the franchise’s path. Or does it? The Force Awakens title comes from Snoke’s line in the movie, ‘There has been an awakening; have you felt it?’ The title The Last Jedi was also pulled from Snoke dialogue, but was included in the opening crawl as well. A new report over at The Hollywood Reporter theorizes that the Star Wars 9 title will also be pulled from one of the existing opening crawls. The Knights of Ren seems like a popular choice, and it hones in on the mysterious Knights of Ren, who were only so far seen in Rey’s Force vision, after she touched the Skywalker lightsaber. They are mentioned by Snoke when Kylo Ren goes to find his father, with the Supreme Leader declaring, “Even the Knights of Ren have never faced such a test.” The backstory on The Knights of Ren hasn’t yet been revealed, and their history is still up for question. Rian Johnson completely abandoned the concept when it came to The Last Jedi, and the Knights weren’t even mentioned in a single line of dialogue. Another popular possible title is The Ashes of the Empire, which is also included in The Force Awakens opening crawl. The full quote is, “the sinister First Order has risen from the ashes of the Empire.” This gets quite literal with the fact that Kylo Ren keeps his grandfather Darth Vader’s helmet on the pile of ashes in his chambers. It is also quite symbolic of the events that happened post-Return of the Jedi. Other titles also pointed to are The Rising Tyranny, which comes from the crawl quote, “Only General Leia Organa’s band of Resistance fighters stand against the rising tyranny.” And one that has been speculated before with A Spark of Hope, which would tie everything together in a nice big bow, and may even give that old Broom Boy Jedi a chance to shine during Life After the Skywalkers. A Spark of Hope is a play on the title of the original 1977 Star Wars, which was only added after its release and the sequel The Empire Strikes Back was confirmed. Whatever the title may be, we could end up waiting until April for it to be confirmed. There is also an unmitigated rumor that the title will be revealed during the Super Bowl, where the first teaser is rumored to drop.